Unseen by consumers, technology sits at the heart of a customer's world, elevating experience without interruption. While augmented reality mirrors are a muscle retailers like to flex, cultivating a personal experience outweighs having tech for tech's sake. Competitive companies have to provide tools for customers and employees to make a custom experience possible. It also means embracing continuous change, which sometimes begs for consultation outside of an IT organization. Speaking at the National Retail Federation Big Show (NRF) in New York City earlier this month, five retail tech executives touched on topics from data analytics to mentorship. Mentorships are a valuable asset for workers that need help getting "in touch with that they already know" but struggle to deal with, said Garvey. They're also a reality check, a "mentorship isn't about 'can you help me find a job?'" The mentor stands as a "logical, linear feature," she said, so having a mentee explore guidance outside their immediate organization will expand "that whole palette of experience." Mentorships, above all else, are about having reliable access to a pool of talented individuals that can offer varying perspectives. "Some people don't see something that's aligned with you," she said, so "you can't listen to that person in that context." Garvey drew from personal experiencing where a mentor in a different area of her former company once asked her, "have you considered that the job doesn't fit you anymore?" She had to consider if the company, where she had climbed to a senior position, was now just comfortable. Ultimately, "I cut the payroll and cut my own job," she said. "One of the unique things about Ralph Lauren is the broad appeal of the brand," said Sherlock. As an iconic American fashion brands, Ralph Lauren has the luxury of transcending age, gender and geography. Janet Sherlock, speaking at NRF in New York City, Sunday, Jan. 13, 2019. The broad scope of Ralph Lauren's reach puts added pressure on personalization. "As a company we really need to focus on consumer as individual, not the label," said Sherlock. Personalization driven by data is the top priority for retailers this year, which demands a "sharpened" focus on analytics. "Data itself speaks to what you assort" and what a brand buys, the content it's delivering, and personalization based on preferences and shipping patterns, according to Sherlock. The company is embracing emerging technologies. Beacons are expected to play a role in a more custom experience for shoppers. Ralph Lauren plans to use technologies like artificial intelligence to gain insights into where customers' shopping preferences lie and where customers are drawn in a physical store. Additionally, the brand is looking for augmented reality "to tell stories" and connect the physical and online worlds of shopping, said Sherlock. The human element of tech is non-negotiable, she said. The industry needs "instinct to come up with an assortment and design inspiration," it's not just AI. Ulta Beauty is a unique enterprise, with 60% of its leadership team and half of its board comprised of women. The beauty retailer's associate workforce is 92% women. Rachel Cohen, Diane Randolph, speaking at NRF in New York City, Monday, Jan. 14, 2019. Having female voices in the C-suite is "really critical," said Randolph, who reports to CEO Mary Dillon. Though it wasn't the only requirement, Ulta was looking for a female CIO, Randolph said, and she was brought onboard in 2014. Having a qualified candidate fill a leadership role is just as important as having a balance in diversity of thought, she said, and many women in IT aren't afforded that opportunity. Likewise, women in IT that are a part of community groups tend to not invite men into the conversation. "Women, being nurturers by nature, introduces a strong culture," she said, but there needs to be more of an education on what a workplace should look like. The beauty retailer routinely performs a culture survey, taking a "pulse" of the entire company, to ensure expectations are understood across all levels of employment. Consumers have shorter attention spans than they used to, said Bhatia, so it's hard to capture attention either in-store or online. Customers are still looking for a social experience. "We are all thankfully not robots, not yet." To find the middle ground, it's expected of businesses to extract appropriate insight with artificial intelligence and machine learning. These technologies help "amplify insights" and make them "actionable." Kohl's has been translating the collected insights into actions for its store associates and to learn how displays impact customer decisions. "You can never predict what that customer is thinking in that minute," said Bhatia. Consumer-facing industries are expected to offer self-serving options, with a near continuous experience at all touchpoints. "Tech compliments everything we do," she said, but with the addition of more technologies collecting mass amounts of data, comes the added pressure of security. "All bets are off when it comes to security ... you have to control what you use," said Bhatia. Finding that delicate balance between having enough data to be innovative but not too much that will infringe on privacy, is something companies are still working on, she said. Less than one-fifth of CIOs are women and in industries with a heavy emphasis on the female consumer, a diversity of thought is a business asset. Still, the glass ceiling persists, with some women offered unhelpful advice like "you need to learn how to play golf if you want to be an executive," Sarah Miller, CIO of Neiman Marcus, told conference attendees. Years later, sitting at the helm of the luxury retailer's technology, having no desire to play golf "has not hurt me one bit." Miller wrote her first computer code at 12 and has since embraced that part of her role as CIO is "to bring more girls and women to technology." 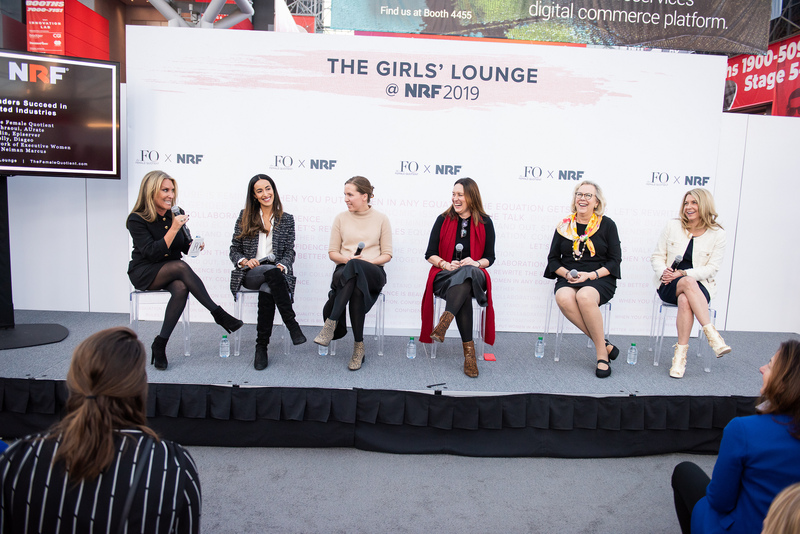 Shelley Zalis, Bouchra Ezzahraoui, Jessica Fardin, Sophie Kelly Diageo, Nancy Krawczyk, Sarah Miller, speaking at NRF in New York City, Monday, Jan. 14, 2019. "I still see girls shying away from technology," she said, which comes down to the education system. Instilling a sense of comfort around coding and algorithms will set students up for jobs in any industry because "it's no longer in businesses where IT is the focus point of tech." Though Neiman Marcus already has "a really great women's organization," the retailer is investing in internal talent. Because of the widening skills gap, "we also have to look outside the United States," said Miller. However, foreign talent can only sustain companies for so long, she explained. Similarly, Miller said the luxury retailer trains existing staff because it's "easier to grow internally than having to always hire externally." In addition to technical skills, Miller looks for hires with strong soft skills like self-motivation because it's harder, if not impossible, to train an individual on motivation, she said.